McDonald’s Canada Coupons valid through April 14, 2019. The coupons include deals like Two can dine for $11.78, Free Buy one Big Mac, Quarter Pounder with Cheese, McChicken, Filet-O-Fish or 6-piece Chicken McNuggets when you buy one or any Bagel or McMuffin sandwich for $2.99. McDonald’s App Ontario and Quebec Specials for this week. Free McCafé beverages with McCafé Mobile Rewards – Earn rewards on your phone, buy any 7 McCafé hot McCafé beverages and get the 8th free. 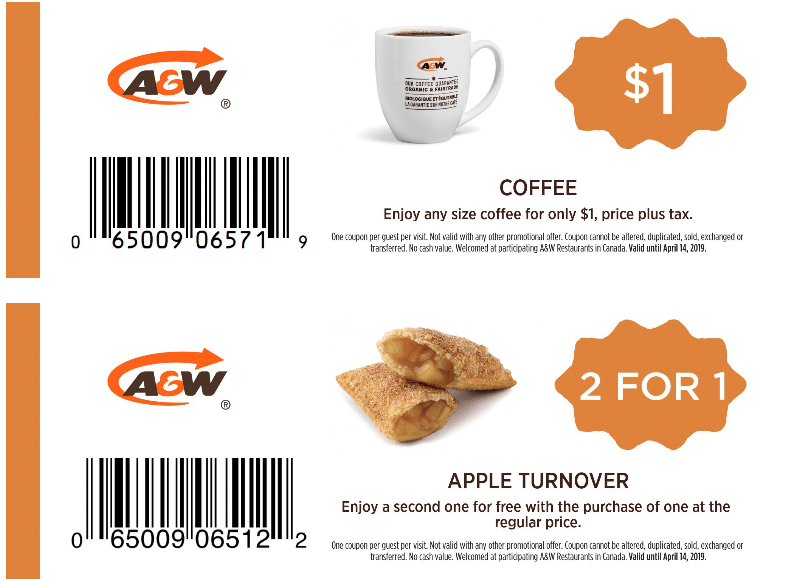 A&W Canada Coupons – Save with the current coupons from A&W, including Coffee of any size for only $1 or 2 for $1 Apple turnover, and much more. Coupons are valid at any participating restaurants until Sunday, April 14, 2019. Redeem one coupon per visit. The coupons cannot be combined with other offers. Show these coupons on your smartphone, or print them. 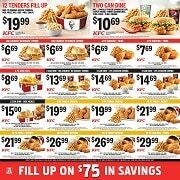 KFC Canada Coupons – valid through April 21, 2019. You can get Two Can Dine Colonels Original Sandwich for $10.99 or 12 Tenders Fill Up – 12 original recipe tenders, medium fries, medium side and medium gravy for $19.99, and more. 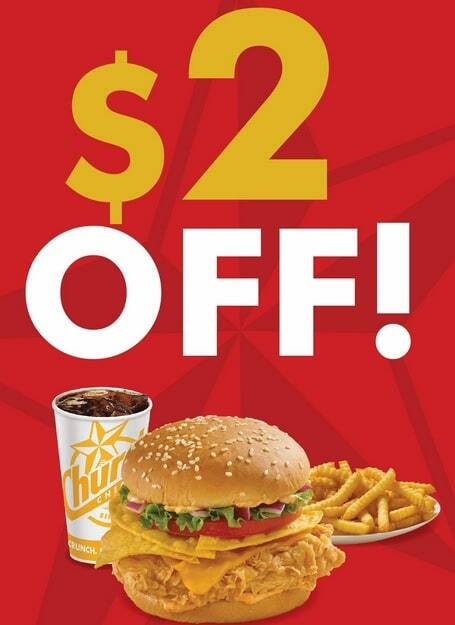 KFC Canada Colonel’s Club App Coupons – Save on your KFC restaurant order with this week offers – 20% OFF Original Bucket and 2 can Dine Big Crunch Combos for $14.69. Colonel’s Club deals are only valid at participating KFC restaurants. Limit of 1 coupon per customer per transaction. Harvey’s Coupons – Buy an Original Burger and get a Regular Fountain Pop for Free. This coupon is valid until May 9, 2019. This offer may not be combined with any other offers. Limit one coupon per guest, per visit. Valid only at participating locations. No cash value. The Harvey’s restaurants have a new offer for your Swiss Mushroom Melt, made with 100% Canadian Beef. No coupon needed. Free Appetizer – Sign up to the Rotisserie Mail and you’ll get a voucher for a free appetizer valid on your next purchase. You can get the 2 Quarter Chicken Dinners for only $17.99 with coupon. Valid for Dine-in/Take-out only. Rotisserie Mail – e-coupon for a free appetizer on your next Dining Room or Take Out visit. For a limited time you can order Swiss Chalet Crispy Chicken. The Deluxe Dinner For 2 is available for only $21.99 with coupon. Save with coupons like $2 OFF when you buy two sandwich combos or Buy 10 Jalapeno Bombers and get 10 Free, and more. Order 2 Cheetos Crunchwrap Slider for just $5 with coupon. Expires April 28, 2019. Coupon valid Valid at Participating Locations. Also view the Taco Bell Menu Offers. Mary Brown’s Canada April Coupon – 2 Snack Chicken Wraps for $4.99. Get the new Buffalo Chicken Tenders for only $9.79 – Buffalo Chicken Tenders, Small Taters, Can of Pop and Ranch Dipping Sauce. Limited Time Offer. Get a Big Mary for only $3.99 plus taxes every Monday. Prices may vary by region. Take a Free Big Mary on your birthday, when you sign up for the monthly newsletter. Mary Brown’s products are made with chicken that is raised by Canadian farmers to the highest food safety, animal care and sustainability standards. Take a Free Combination of 3 CocaCola Drinks or Dips with orders of $20 or more, with coupon. Get 5% Back On Every Purchase. Register your Pizza Pizza Club 11-11 Loyalty Card or any Pizza Pizza Gift Card and receive savings – 5% in Loyalty ‘Dollars’ on every order. Order only 5 times and redeem your Loyalty ‘Dollars’ after every 5th visit. Loyalty ‘Dollars’ must be redeemed within 90 days after your 5th visit. Take a Medium or Large Pizza of the Day for $10 or more. Available Online Only. Save $4 when you order a Medium or Large Pizza from Pizza Hut. The pizzas are configurable with pan, hand-tossed or thin and crispy crusts. Offer is available for a limited time only. Delivery charges are not included with the price and will vary depending on location. Also, get Two Medium Pizza’s for $24.99 – include 2 medium pizzas (3 topping or recipe) or $24.99 for Pizza and Wing – 3 topping medium pizza, 8 boneless bites, your choice of sauce and 2 dips. 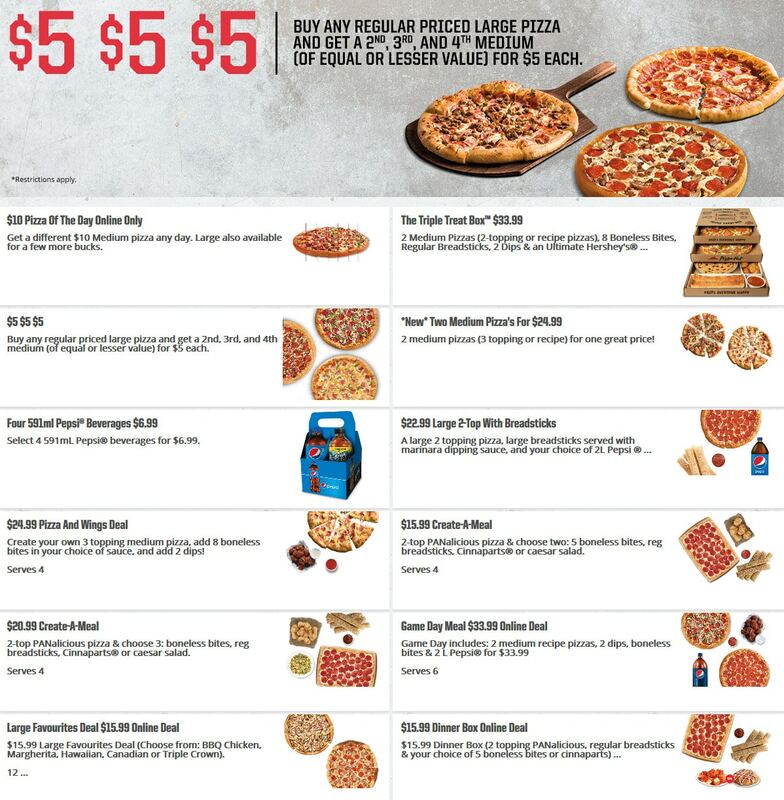 Pizza Hut $5 Deal – Order Any Large Pizza at Regular Price and Get Up to 3 More Medium Pizzas for $5.00 Each. All pizzas are eligible for this offer, but the second, third and fourth pizza must be of equal or lesser value. This offer cannot be combined with any other promotions. 2X Tuesday Deal – Buy any Pizza and get a second Pizza of equal or lesser value Free. Use Promo Code: CATD4QY7. Take 50% OFF All Pizzas – Mix and match with all your favourite toppings, and 50% OFF discount. This offer is valid at participating locations only. Pan Pizza and gluten-free pizza may be subject to additional charges. Get Medium 4-Topping Pizza for only $9.99. Prices may vary by location. Pan Pizza and Gluten Free Pizza may be subject to an additional charge. 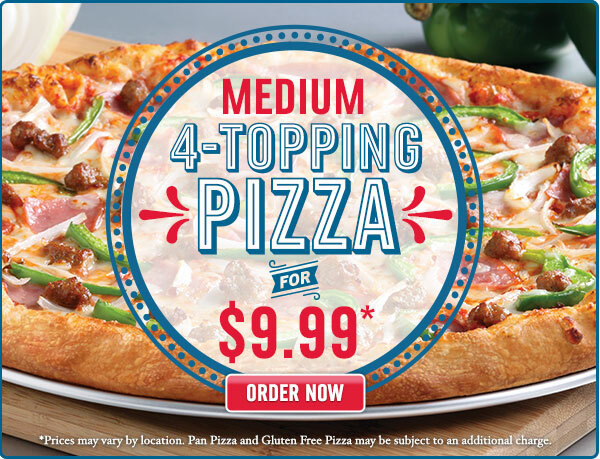 Upsize to a Large 4-Topping Pizza for only $3. – Get Unlimited Medium 2-Tpping Pizzas for only $7.99. – Earn 10 points for every online order of $10 or more. – Once you earn 60 points you can redeem them for a free Medium 2-Topping Pizza. At participating Domino’s locations, online orders of $10 or more (tip and donations excluded) placed with your Pizza Profile earn 10 rewards points toward Free Pizza. Only one order per calendar day can earn points. Coffee & Tea Refill Tumbler 2019 – Get a Free Coffee or Tea Every Day in January 2019 When You Buy a Tumbler for $55.00. The tumblers will be available at Starbucks locations starting November 20, 2018. Buy one and present it to the barista every day in January 2019 to get the free drinks. Starbucks Reserve coffee is excluded from this offer. Offer available while supplies last. New Flyers via e-mail ! If you want the best specials and sales, then the Canada grocery & retail store flyers are great for saving money on food, appliances, electronics, household products, groceries, home decor, toys, clothing, footwear, furniture, tools, beauty products, and more.Everything you need to know before going to shop, regarding current specials, promotions & sales can be found in this week flyers.New offers are available every week for your favorite stores, from Toronto, Ottawa, Brampton, Hamilton, Windsor, Montreal, Quebec City, Calgary, Edmonton, Winnipeg, Vancouver, Halifax, to St. John's.Also, check the Blog for the latest store and products news and information. If you want the best specials and sales, then the Canada grocery & retail store flyers are great for saving money on food, appliances, electronics, household products, groceries, home decor, toys, clothing, footwear, furniture, tools, beauty products, and more. Everything you need to know before going to shop, regarding current specials, promotions & sales can be found in this week flyers.